In the 1984 Book of Praise, the Pentecost Hymn "Come Praise the Holy Spirit" had been set to the Lent tune "Ick wil mij gaen vertroosten" (I will seek my comfort [in the passion of Jesus] as Hymn 37. 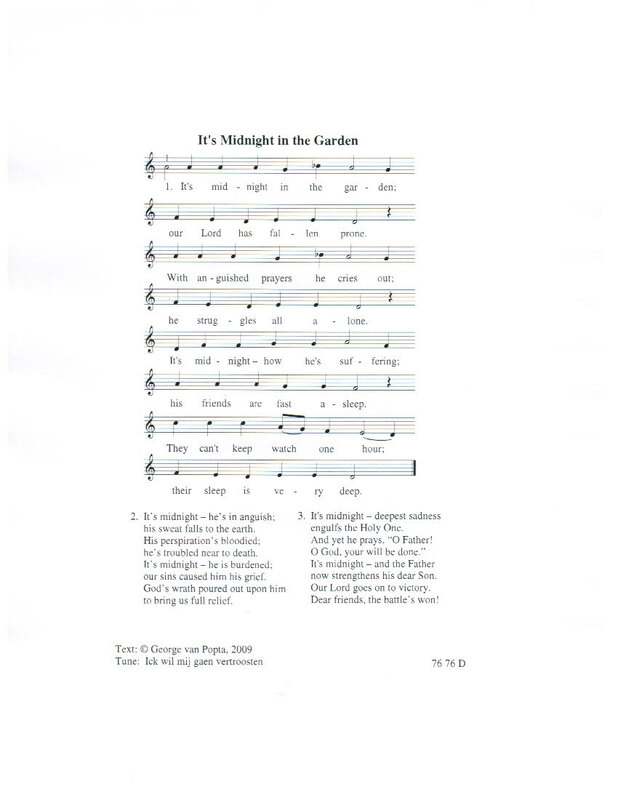 A beautiful hymn set to a beautiful tune, but quite mismatched. The tune is very mournful and elicits a sad feeling. The lowest note is a D and the highest a C, so it does not span even an octave. The intervals between notes are small. All is kept quiet and subdued. Very appropriate for Lent. In the new Book of Praise, "Come Praise the Holy Spirit" is set to the joyful tune Thornbury as Hymn 48. There are many large intervals and the notes span more than an octave. It is in the key of D, a very joyful one. Setting this hymn to Thornbury is, I believe, an improvement. Once we have grown accustomned to this tune, we will come to love it, and yet, it seems a pity to "lose" the beautiful and haunting "Ick wil mij gaen vertroosten." Here is an attempt to "save" it. 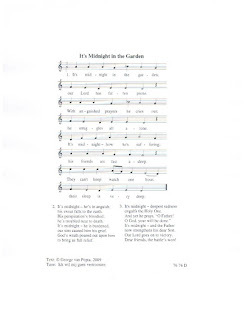 I had originally set "It's Midnight in the Garden" to the tune "Vigil." But since the metre is 76 76 D, it can also be set to "Ick wil mij gaen vertroosten."